Each year Mandy Robek of Enjoy and Embrace Learning and Cathy Mere of Reflect and Refine: Building a learning community host a picture book 10 for 10 event on August 10. The picture book 10 for 10 event, is an opportunity for bloggers to join together and share the 10 picture book "must-haves" for the classroom. I first joined the event in 2010 (which I think was the kick off year). I had a "new" 10 month old baby that year, and I shared my 10 favorite books to add to a baby's library. In 2011, my older son, Logan was a preschooler, and I shared 10 favorite picture books to add to your playtime. This would be a great list for a preschool classroom. Last August I was too busy to write a list. Instead, I perused all of the other wonderful lists. You can find all of the suggestions on the blog jog. Of course, you may do what I did that year. I spent way too much money purchasing picture books from Amazon! My husband loved that! This year, I am playing by the rules and sharing 10 must-have picture books for the classroom. Well, I did add one little twist to my list. I noticed that many of the books I had on my list had been recommended by other kid lit bloggers. In fact, almost all of the books were recommended through a weekly meme in which I participate. Each day on facebook, and often twitter and G+, I share a picture book of the day. These recommendations are put together by a group of bloggers. We have a weekly schedule and we all share our favorites. You can find these lists on my facebook page every day or by following #pbotd. Today I am sharing both the recommendation of the blogger and my own thoughts on the book. Links are amazon affiliate links. Growing book by book recommended this book as a great mentor text for writing. I would agree that this is a perfect book for using in writer's workshop. But, we love it because it's just so funny. The illustrations are so detailed and provide a great depiction of the experience of waiting in line and riding a roller coaster. You can actually people watch while you read this book. This is a book that I recommended on the picture book of the day meme. It has become a favorite book in my home. In this story, a girl wakes up to hear birds singing. As she goes through her day, she observes and comments on features of birds. She wonders aloud about birds. She tries to mimic the flight of birds. In the end, she discovers the one thing she can do that birds can also do. I've created math, science, and art activities from Birds, so it's a great addition to the classroom. The Good Long Road recommended this alphabet book. I was instantly interested in the book and had to purchase a copy. It's a wonderful alphabet book. The layout is simple and clear for beginning learners. I love how it adds diversity to the classroom library. 4. Jamberry by Bruce Degan -- What do we do all Day? In the words of Erica from What do we do all Day?, "This classic was published more than 25 years ago. If you haven't read it, get thee to the library!" This may not be the newest book on the shelf, but it deserves a place on the shelf of every single classroom. There are many rhyming books to choose from but none are as imaginative as "Jamberry". It is silly and fun and begs to be read again and again. Pragmatic Mom found this book related to the keep out signs that were being posted around her home. Does that sound familiar? I'll bet it will sound familiar to the kids in your classroom, too! The Monstore will help your kids do a bit of creative problem solving. I think every classroom library deserves to have books with the levels of creativity you'll find in this story. Mother Daughter Book Reviews did a Father Son Review of Hi! Fly Guy. My five year old son also loves this book about a boy and his "remarkable" pet fly. This is a great book for early readers. In fact, I heard my son reading this one (nearly) independently in the back of the car the other day! Boys will definitely love this one, but girls will probably enjoy it too. There are other books in this series. We also love Fly Guy meets Fly Girl. "The Man who Walked between the Towers" isn't a new book, but it came to my mind when Nick Wallenda's Skywire walk was aired on the Discovery channel this summer. It is a wonderful Caledcott award winning book. Children can use the book, "The man who Walked Between the Towers" to compare the experience of watching Wallenda's walk on Skywire on the Discovery Channel. The controversies surrounding both Wallenda's skywire and Petit's high wire walk may inspire some students to write argument or opinion pieces. The book also addresses the twin towers, so it would be interesting to add to a classroom discussion on September 11th. Reading Confetti used this book with her children when they showed a strong interest in bald eagles at the zoo. They found this book at the library and made a cute handprint and footprint bald eagle craft too. I included this book as a reminder that one "must-have" for a classroom library are books that follow the interests of the children. My five year old tells us all of the time that he wants to be a scientist that studies birds. When I saw this book recommendation, it was one I had to check out! KC Edventures recommended this book as a great book for summer reading. It can also find a place in your classroom this fall, though. This wordless picture book takes the readers on a journey underwater as a boy finds an underwater camera and discovers the secrets of the deep. This is a great fantasy story. I love wordless picture books for the classroom for read alouds, independent reading, and writer's workshop. The Incredible Book Eating Boy would make a wonderful book to kick off your school year. It's pretty obvious what this book may be about. In this story, Henry likes to eat books and as he eats books, he grows smarter. Eventually he ends up with a giant stomach ache and jumbled up facts. He does learn to enjoy books without necessarily consuming the pages. It's always great to start the year off with a funny book. This book sends a great message about the importance of education and reading. Plus, while Henry is devouring genres, your students may learn a few things about different types of reading. Just make sure they know the class rules, "No eating books!" This book was recommended by kid lit blogger, Bethany of No Twiddle Twaddle. She is the organizer of the picture book of the day meme. Check out her blog and follow along using #pbotd or by following any (or all) of the facebook pages that I linked in this post. 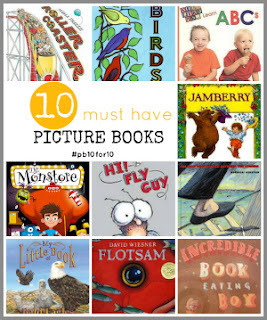 My picture book 10 for 10 list for 2013 is complete. I can't wait to start reading all of the top books that other teachers and bloggers have chosen. As organizer Cathy Mere says, "Warning! This event is rated D for dangerous! It's possible that your wallet will lighten and your shelves will grow smaller by participating. This event is intended for book loving audiences." Love, love, love your list Jackie! 10 for 10, Picture Book of the Day and Ready Set Read! are all of some of my favorites. What a great idea to combine all three. Thanks for including me in the list! Love it! Thanks for including one of our books. I'm glad that it was a good book suggestion for you. This would be a great list for someone looking to start their Picture Book Library at home. Love this list! Last year I paired Flotsam with Immi's Gift by Karin Littlewood, which also ends with the realization that kids from far away places are indeed connected. It's so fun to find new picture books through Picture Book of the Day! Thanks for including us in your list! Thanks so much for including my pick! Too bad I haven't heard about this earlier! We still read picture books, but now they are usually longer :) I think many picture books can be "stretched" between ages and appeal to different audiences, those are usually the books I pick for our own home library. The picture book 10 for 10 has been every August 10, so mark your calendar for next year ;)There are so many great longer picture books too! I can't wait for the boys to be a little older so they have a little more attention for some of them!